Driggs Family News: Look what I found! 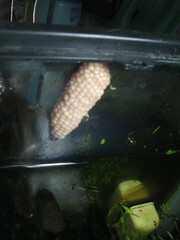 Snail eggs! I am very excited, I've never had brigs eggs before. I'm reasonably certain that the parents were a striped yellow and an ivory, too, so I may get some red and whites, and more purples. I'm incubating them in one of those Gerber bottle liners with paper towels, using badflash's plastic bag method, for anyone who cares to know.